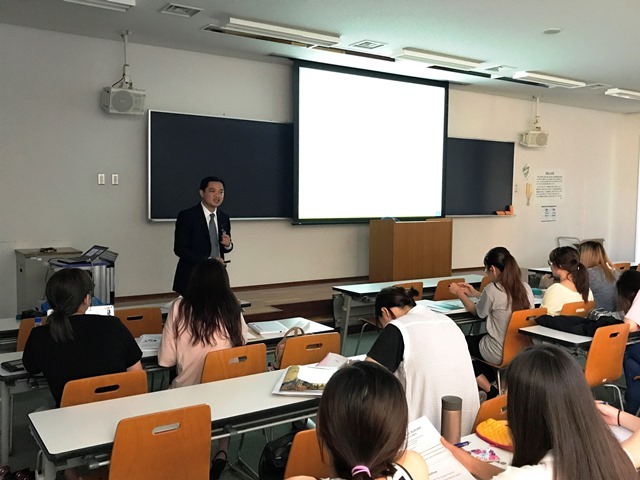 Mr. Vathouniyom Douangmala, Director of the Tourism and Exchange Division of the AJC gave a lecture at the Sagamihara Campus, Aoyama Gakuin University on July 10, 2017, in response to a request by the University. The lecture was attended by around 70 students from the Department of Global Studies and Collaboration, who were enrolled in a class on “Tourism in Asia”. In his lecture titled “Tourism Policies in ASEAN – its contribution to AEC“, Mr. Vathouniyom elaborated on the history of the ASEAN, features and challenges of the ASEAN Economic Community (AEC) and the ASEAN Tourism Strategic Plan 2016-2025. He also briefed the students on the AJC’s activities to promote tourism as well as exchanges of persons between the ASEAN Member States and Japan; and shared attractions of Lao People’s Democratic Republic, his home country, with the students. The lecture was well-received by the students as Mr. Vathouniyom received many insightful comments and questions from the students, including those on the ASEAN-Japan relations and uniqueness of the Japanese tourists. Copyright© ASEAN Promotion Centre on Trade, Investment and Tourism. All Rights Reserved.